I know it's only four weeks since Italy, but I'm having another quick break. Off to London tomorrow to do a bit of shopping and perhaps pay a visit to my former school (St John Rigby in West Wickham). Back in the chair on Friday evening. PETROLHEADS OF THE WORLD UNITE! I don't agree with some of the views expressed by Jeremy Clarkson but when I hear that pompous bore and greenie-adviser to Prince Charles Sir Jonathon Porritt has launched a scathing attack on the presenter of the BBC2 motoring show Top Gear, branding him an "outstandingly bigoted petrolhead", I warm to Clarkson! Yes, I do. Clarkson has insisted there is almost certainly no such thing as global warming, threatened to run down cyclists who get in his way and vowed to keep his patio heater lit 24 hours a day, just to annoy Greenpeace! Top guy! Now, I'm off for a drive in my uber gas guzzling ozone depleting glacier melting sea level raising 4x4! Continuing my theme of beginning today's submissions with titles created by the Beatles, I found this story astonishing in Bradford's Telegraph and Argus. People on long-term sick living in the city will be offered free trips to museums and art galleries in order to entice them back into work. Bradford is being used as a guinea-pig for the scheme because of its high level of Incapacity Benefit claimants. Let's get this clear in our minds. People who have effectively sponged off the State for a long period courtesy of the tax contributions of the majority, will now be given for free what everybody else has to pay for in order to get them to do what they should be doing in the first place. There are some genuine benefit recipients - especially the disabled - and I do not direct my vitriol at them. I refer to the majority (and it is a majority) who use the relative ease of claiming IB so they can sit on fat backsides in front of the television each day. For the quintessential picture of the average IB claimant, think Onslow in Keeping Up Appearances. Have you ever known another country to go to such lengths to do the most for people who are prepared to do the least for themselves (and vice-versa)? If you are a hard-working person with a sustainable income in this country, you become a cash-cow for wasters. No wonder so many think that claiming benefits is the cushy option! 'Am I the only one who finds it funny when he talks about dragging the reputation of the British nation through the mud? It has no reputation worth saving FFS! SAVAGERY THAT THE MEDIA IGNORES.. I was reading this story about how the Palestinian "militants" deal with those who cross their path..
Masked Al Aksa Martyrs' Brigades gunmen on Tuesday publicly executed a Palestinian man and woman they suspected of having spied for Israel. The man was shot dead in the main street of a refugee camp, with a large crowd looking on. The woman was later shot to death by her relatives in the courtyard of the West Bank's largest hospital. The Aksa Martyrs' Brigades, an offshoot of Palestinian Chairman Mahmoud Abbas's Fatah movement, accused Jafal Abu Tzrur, 24, of having informed the IDF where to find three of its members. The three were killed by IDF troops during a raid on the Balata refugee camp near Nablus earlier this year. Al Aksa gunmen interrogated Abu Tzrur, claimed he confessed and then dragged him into Balata's main street. As a large crowd looked on, the gunmen threw Abu Tzrur to the ground, witnesses said. When he tried to get up, the gunmen killed him with several shots, the witnesses said. The movement said it also killed Odad Abu Mustafa, 27, a Nablus woman. Abu Mustafa was married to one of the Aksa men slain by Israel, and was reportedly having an affair with Abu Tzrur. Abu Mustafa, a mother of four, was shot by gunmen and male relatives on grounds that she shamed her clan. More than 15 people took part in the execution, witnesses said. It took place in the courtyard of Raffidiyeh Hospital, the West Bank's largest. The mob originally planned to kill her in the street but were swayed by a man who pleaded with them not to carry out the killing in the view of little children could. She was then taken into the courtyard of the hospital, said Yousef Mahmoud, 18, who witnessed the killing. "One of the gunmen said 'where is her brother?' and when he stepped forward they said to him 'you know what you need to do,"' he said. "The brother took out a gun and shot her in the head with one bullet." Mahmoud said the brother then emptied the entire clip into the body of his sister, while the surrounding gunmen fired into the air. He said that the woman remained silent throughout and did not resist her captors. Neighbors of the woman said she had four children; two boys and two girls, ranging in age from 11 to three and a half. Naked savagery from those who the world tell us "need" to have their very own little State. How tragic for the young children to lose their mother in this way. And not even a HINT of MSM outrage - no calls for "moderate" Mahmoud's Al Asqa hoods to be arrested. No urgent enquiries, no UN condemnations. Nothing. This is Palestinian justice. Every PENNY that we, the taxpayers, provide this lousy Government with care of the punitive taxation regime should be used wisely. So what are to make of the news that more than £2bn of tax credits has been overpaid for a second year running? Families given too much during the 2004-2005 financial year could now face having to make reimbursements. I suppose they also owe from the over-payments received in the 2003-2004 financial year? Last year, on this subject, I had a go at the recipients of this unwarranted largesse and received some criticism for it. This year, my target for criticism is directly and unambiguously - the Government. It is primarily responsible for how it spends OUR money - and to waste £2billion is a disgrace. How many heads will roll? None. Did you read that bloated ego-on-stilts pop singer Morrissey has entered the controversy over the new Oxford animal research laboratory by warning those working on the site: "We'll get you". The former Smiths frontman used a concert at the city's New Theatre last Thursday night to condemn the £20m biomedical research laboratory site currently under construction in South Parks Road.He called Oxford "the shame of England" for allowing the laboratory to be built and told fans: "If you agree with vivisection, go and be vivisected upon yourself." 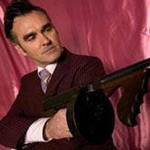 Now I know Morrisey has the mental age of a thirteen year old, and I know that anyone who would listen to his juvenile caterwauling is mad BUT... many of these so-called "Animal Rights activists" aka terrorists ARE mad and could decide to follow his instructions. A grossly irresponsible statement from a sad old hack of a singer. Change the record. It's speaks volumes for our modern progressive society that random drug-testing is set to be rolled out to all secondary schools in England as part of an alleged crackdown on drug use among pupils. A Department of Health report recently disclosed that one in every 50 schoolchildren claimed to have taken cocaine and 12 per cent said that they had smoked cannabis. Overall, 19 per cent said that they had taken illegal drugs — up from 11 per cent in 1998. If this rate of drug taking accelerates at the same rate, in ten years time one if five schoolchildren will have taken illegal drugs. US marines are natural born indiscriminate murderers. They eat Iraqi babies for breakfast. Life was much better under Saddam. The Jihadi have the upper hand, we just can't win. What about Abu Ghraib? How about an exit strategy? And now..Haditha. We're doomed. Turner Grant, his cousin John Gilbert and his sister's fiance Charles Lovejoy had been friends since boyhood and all three enlisted on the same day. Charles died on March 5, 1863, Turner on March 6, and John on March 11. Nothing splendid or heroic. They were tentmates in Virginia, and there was an outbreak of measles in the camp. For some reason, there was a bureaucratic mixup and the army neglected to inform the families. Then, on their final journey home, the bodies were taken off the train at the wrong town. It was a Saturday afternoon and the stationmaster didn't want the caskets sitting there all weekend. So a man who knew where the Grants lived offered to take them up to the next town and drop them off on Sunday morning. When he arrived, the family was at church, so he unloaded the coffins from his buggy and left without a word or a note to anyone. Imagine coming home from Sunday worship and finding three caskets waiting on the porch. Imagine being young Caroline Grant, and those caskets contain the bodies of your brother, your cousin and the man to whom you're betrothed. If it happened today, maybe Caroline would be on Diane Sawyer and Katie Couric demanding proper compensation, and the truth about what happened, and why the politicians were covering it up. Maybe she'd form a group of victims' families. Maybe she'd call for a special commission to establish whether the government did everything it could to prevent disease outbreaks at army camps. Maybe, when they got around to forming the commission, she'd be booing and chanting during the officials' testimony, as several of the 9/11 families did during Mayor Rudy Giuliani's testimony. Mark's point is wars are messy. War is not something that can be prosecuted without, sadly, wrongs being committed. But that does not invalidate the purpose and success of the war. Playing by Gore-Kennedy rules, the Union would have lost the Civil War, the rebels the Revolutionary War, and the colonists the French and Indian Wars. There would, in other words, be no America. I would add, played by liberal MSM rules, the Second World War would have been lost. Where was the "exit strategy" for Germany and Japan? What about all the innocents who died at Hiroshima? When did FDR "know" about Pearl Harbour? The liberal whine that permeates through the MSM daily, hourly, undermines our success in Iraq. It paralyses our political leaders from being more decisive and doing that which is right and proper. Above all, it provides comfort and support to our enemies. The MSM and it's bleak self-loathing agenda IS the enemy within. Well then, I guess we ALL know that the IRA and Sinn Fein are "inextricably linked" but who would have guessed that Tony Blair and John "Jabba" Prescott are also "linked together"? It is being put about that Prescott will only step down from the Cabinet when Tony Blair also sets a date for his own retirement, Prescott's biographer has said. I wonder WHERE he could have got that crazy idea? Mmmm? Colin Brown also said the prime minister had stressed that the pair were "linked" and there was "no intention that they will go separately". This strikes me as a blatant attempt by neanderthal Prescott to warn off Blair from taking away his grace and favour bounties that he so enjoys. It's almost a veiled threat, isn't it? I mean it's as if Prescott is saying to the PM that he can't be removed from the office of Deputy PM UNLESS Blair is prepared to go as well. 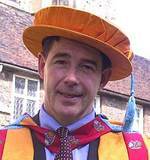 What has he got on Blair that so renders the PM impotent to move against this clown? Will Prescott bring Blair down?